The Rolling Stones’ 1965 hit “The Last Time” has one of the more revealing genealogies in rock history. Although the London School of Economics dropout Jagger and Stones guitarist Keith Richards get the sole songwriting credits (in other words: money! ), Richards has cited as an inspiration James Brown’s 1965 “Maybe the Last Time,” itself drawn from the Staples Singers’ “This May Be the Last Time,” which in turn is based on an age-old African American spiritual. But the Verve, who sampled merely an orchestral version of the Stones’ already-derivative song for their 1997 single “Bitter Sweet Symphony,” famously had to forfeit all publishing rights to their biggest hit. In one sense, “The Last Time” can be seen as just another example of well-to-do British settlers appropriating what used to be public domain, a tradition that runs from the Jamestown colony to the BP oil spill; in another sense, that’s just how pop music works. 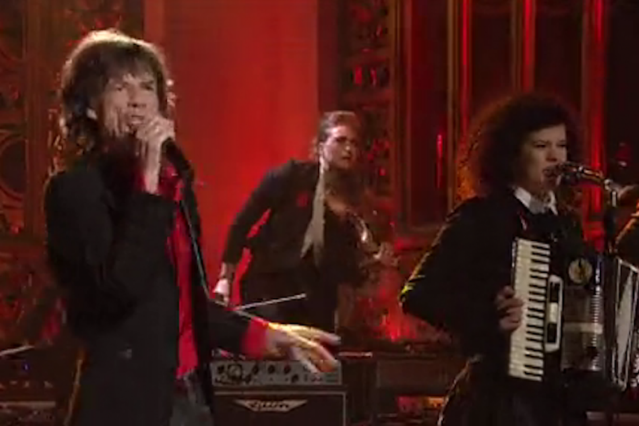 Jagger’s performance of “The Last Time” on SNL was deeply reverent of the song’s pre-rock roots, with a gorgeously harmonized gospel introduction giving way to Arcade Fire’s rollicking, contagiously enthusiastic backing (with the Strokes’ Nikolai Fraiture playing bass). Equally superb was Jagger’s medley of the Stones’ “19th Nervous Breakdown” and “It’s Only Rock ‘n Roll (But I Like It)” backed by the Foo Fighters, who — in, it must be said, a total rock-star move — helicoptered to SNL after their set at New Jersey’s Bamboozle. An Arcade Fire-led medley comprising two of the Beatles-iest Stones tunes, “She’s a Rainbow” and “Ruby Tuesday,” accompanied a touching farewell to cast member Kristen Wiig, who is moving on after this season. By singing with two of the most respected purveyors of independent-thinking rock, Foo Fighters and Arcade Fire, Jagger was in effect passing the torch. And he could hardly have picked two worthier heirs: Both groups are able to cross over and excel in the world of Grammy ceremonies and stadium shows, but both also maintain a cautious distance from that world that reflects rock’s early image of rebelliousness. As awkward as it can be to see a style that was once about youth and rebellion receive the sort of reverent, tradition-based tribute you might’ve once expected for jazz or classical (where are the Marsalis brothers? ), everybody involved made it work, including Jagger himself. It was rock’n’roll, and it was deeply likable — perhaps, in the post-Adele, post-Gotye moment, there’s room for music like this again in the pop charts? What put the whole nostalgic celebration in an even more thought-provoking context was its juxtaposition with “Lazy Sunday 2,” in which Andy Samberg and Chris Parnell reprised their hit rap sketch that essentially paved the way for online videos to “go viral” in the first place. Hip-hop, itself once an insurgent underdog, is now also a hallowed tradition, so much so that the original “Lazy Sunday” clip is now nearing seven years old, and when the new clip alludes to a Jay-Z song, it’s alluding to a guy who recently performed at Carnegie Hall. “Lazy Sunday 2″ can’t possibly pack the viral punch of the original — the novelty is gone, as is that pre-YouTube moment — but it’s still a funny, colorfully quotidian examination of live in New York City (make it to the restaurant by 3 p.m. or you can’t order off the brunch menu). We’ll probably never see Mick Jagger, Foo Fighters, and Arcade Fire all together on the same stage again — but we’ll never hear another Paul’s Boutique, either. And the constant threat of sampling lawsuits is a part of that. With rap already decades old itself, there’s a risk that the sort of creative theft that once allowed the Stones to make a song like “The Last Time” will be considered illegal when the next creatively rebellious style arrives. It’s only the future, but we really want to like it.